Ruby Wax is a comedienne, keynote speaker, presenter, mental health campaigner and best-selling author. Arriving in Britain from the United States in the 1980s, Ruby wax began her acting career with the Royal Shakespeare Company. She began her TV career writing and starring in Girls on Top with French and Saunders and Tracey Ullman. 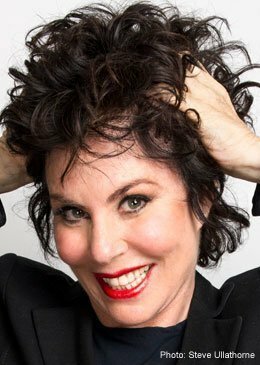 She is probably best known for her television series Ruby Wax with… in which she performed memorable interviews with major celebrities such as Donald Trump, Imelda Marcos, Madonna, OJ Simpson, Goldie Hawn, Jim Carrey, Ben Stiller and many others. On stage Ruby has been directed by Alan Rickman in her own one-woman shows. These range from Wax Acts and Stressed in the late 1990’s through to the more recent Losing It, Sane New World (directed by Thea Sharrock) and Frazzled which she has taken all over the UK and Australia as well as to the United States, Cape Town and London’s West End. Her writing and script editor credits include among many others, Not the Nine O’clock News and all series and the film version of Absolutely Fabulous. Following her hugely successful career with BBC television as an interviewer and comedian, Ruby Wax has now turned her attention to the study of psychotherapy and neuroscience, recently receiving her Master’s degree in Mindfulness Based Cognitive Therapy from Oxford University. She is the author of the best-selling book ‘Sane New World’. Described as a guide to saner living, Ruby explains how our minds can jeopardize our sanity, and that to break the cycle, we need to understand how our brains work, rewire our thinking and find calm in a frenetic world. Her show of the same name, helps audiences become the masters, not the slaves of their minds. She also founded Black Dog Tribe, a social networking site providing information and social support for people suffering with mental health issues. She presented her TedTalk at TedGlobal 2012 “What’s So Funny about Mental Illness?”, and has been awarded an OBE for services to mental health. She is currently launching her Frazzled Cafes in partnership with Marks and Spencer’s throughout the UK. Each Marks and Spencer’s will close their cafes for two hours for groups to meet regularly. These are not necessarily for people with Mental Health problems but for everyone who is frazzled, which is everyone. Based on the format of AA each group is run by a facilitator with a mental health background. Dealing with Stress in a Work Environment, or How to Survive the 21st Century.